University of Michigan students are demanding the termination of their school’s athletic director after a weekend incident involving a severely injured college football player and the first three loss September in school history. Over 10,000 people have signed the petition to fire athletic director Dave Brandon as of late Wednesday morning. The petition does not directly mention Saturday’s loss to Minnesota, where Michigan quarterback Shane Morris took an illegal hit to the head, but it does say that the university has suffered a “black eye”. During the game, instead of immediately pulling Morris from the rest of the game, coach Brady Hoke sent his quarterback back in to play, despite clear signs that Morris had suffered a concussion. The player was already hobbling due to a prior leg injury. 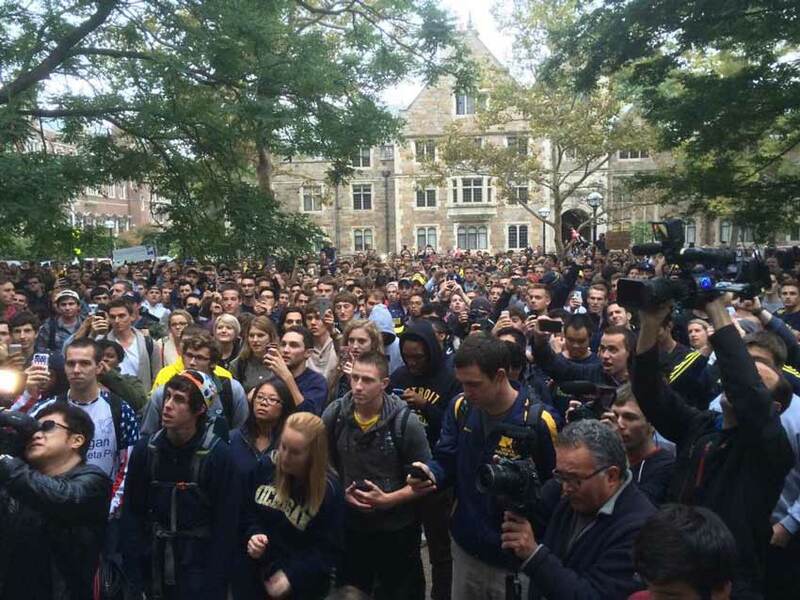 Michigan’s student body, meanwhile, is livid. In addition to the petition to fire the athletic director, students have staged a series of protests on campus. “In accordance to the principles that athletics are supposed to unite and bring positive energy to campus, we request that President Schlissel remove Mr. David Brandon from his position as Director of Intercollegiate Athletics,” the petition says. Dave Brandon is the current Director of Intercollegiate Athletics at the University of Michigan. He has held the title since 2010. Upon being named the Athletic Director, Mr. Brandon stated “athletic programs play [a role] in helping to shape the culture and image of our university community.” Unfortunately, under Mr. Brandon’s tenure, the football program, one of the most prominent programs at the University of Michigan and in the nation, has become a black eye for the University of Michigan. Instead of adding to the image and prestige of the university, the state of the athletic department has hurt the connection shared between alumni, fans, and the university. Furthermore, policies and decisions of the athletic department have alienated the current student body. As a result, the university risks producing a generation of alumni that are disinterested and disengaged. Finally, President Mark Schlissel previously stated that one draw of the athletic program is to provide an avenue for “public attention on to the other wonderful things that are happening on campus…” When the athletic department produces overwhelmingly negative media attention, it distracts from the main mission of the university. “Policies must be followed in full. The injuries of student-athletes must be addressed with the precision and care that are compliant with code. Officials, staff members, and managers must, and should, be held accountable for their decisions and the actions that follow. CSG joins the voice of students and their demand for managerial culpability,” Dishell wrote. South Bend Voice reached out to the petition’s author, Zeid El-Kilani, for comment. We will update the story if we receive a response.